Sometimes we read a marketing text, and all we can think is Yeah, yeah. It sounds okay, but we don’t quite believe it. The text feels superficial and lacks flair. We’re not tempted. We’re not enchanted. We feel resistance to reading and buying. How can you add pizzazz to your writing so people enjoy reading your business content? How can you establish credibility so people believe your words? In fiction writing, the concept of “Show, don’t tell” gives a story oomph. With a little adjustment, you can use the same concept in your marketing so readers don’t question your content. Instead, they get swept up by your words. In the book All the Light We Cannot See, Marie-Laure, one of the central characters, is a blind girl. Initially, author Anthony Doerr doesn’t tell us she’s blind. He lets us experience her world of smells, sounds, and touch first. She can hear the bombers when they are three miles away. A mounting static. The hum inside a seashell. She eases open the left-hand shutter and runs her fingers up the slats of the right. A sheet of paper has lodged there. She holds it close to her nose. It smells of fresh ink. Gasoline, maybe. Marie-Laure hesitates at the window in her stocking feet, her bedroom behind her, seashells arranged along the top of the armoire, pebbles along the baseboards. Her cane stands in the corner; her big Braille novel waits facedown on the bed. Anthony Doerr could have just written that Marie-Laure is blind, but the description of her world is more powerful, allowing us to experience the story as if we’re Marie-Laure. The sensory details draw us into the story. The idea of showing lets fiction readers experience a story by sharing sensory details and describing actions. Telling speeds up the story by eliminating details. Spaces she once knew as familiar—the four-room flat she shares with her father, the little tree-lined square at the end of their street—have become labyrinths bristling with hazards. Drawers are never where they should be. The toilet is an abyss. A glass of water is too near, too far; her fingers too big, always too big. The despair doesn’t last. Marie-Laure is too young and her father is too patient. Showing requires more words than telling because descriptions of actions and scenes are longer than simple statements. Sharing details slows readers down, while telling speeds up the story. Business readers are more impatient than fiction readers. Fiction readers “live” the story. They want to be entertained; they want to read the details so they can experience the story. This is why showing is so important in fiction. But business readers are task-oriented. They want to know quickly what you offer. They don’t want to spend hours learning a simple trick. When business content focuses too much on showing, scanners might miss key messages because they’re buried underneath too many details. But without a dose of showing business content lacks depth. Showing allows readers to imagine experiencing our products and services, and that makes our sales pitch more persuasive..
With Pencil, we’ve radically simplified things like charging and wireless connection so you can spend less time in menus and more time creating. Under normal use, you won’t need to recharge Pencil for about a month. The battery can be slid out and recharged on any standard USB port in under 90 minutes. Bluetooth connection as it should be: no settings menus, no confusing pairing rituals. Just press Pencil’s tip to the screen. Clear, stable, simple… easy as falling in love. The headline tells us a key message: it’s simple to use the Pencil. The copy shows us how easy it is to use the Pencil by sharing specific details on recharging and connecting. At the heart of iPad Pro lies the new A9X, our third generation chip with 64 bit desktop class architecture. It delivers up to 1.8 times the CPU performance and double the graphics performance of iPad Air 2. So even the most demanding apps run effortlessly. The headline tells us the iPad Pro has Apple’s most powerful chip. The copy then shows why the chip is powerful and why this matters: it’s a 64-bit desktop-class architecture; it delivers up to 1.8 times the CPU performance of the iPad Air 2; and it also doubles the graphics performance of the iPad Air 2. Note how these sentences are full of details. The paragraphs ends with telling us that the iPad Pro runs the most demanding apps effortlessly. Good sales copy balances showing and telling. As business bloggers, we’re mentors to our readers. We build our authority by sharing our advice, and encouraging readers to implement our tips. 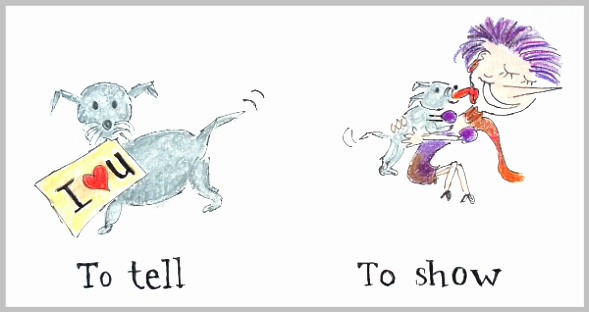 Telling and showing is the two-punch winning technique of any educational writing. But telling and showing also allows you to write captivating opening paragraphs. Do you ever read a draft of your writing and wonder why it sounds bland? In this post, I’ll tell you how to make your content dazzle and dance. Sounds more enchanting, eh? The description with sensory details makes the introductory paragraph much longer, but also more compelling. Telling only is boring; it sends your readers to sleep. Showing helps readers visualize and experience your content. Because details add pizzazz. Good business writers communicate key messages with clarity, and then use details to allow readers to experience their ideas. Find a balance between sensory details and quick messages. Let your content ebb and flow. Thank you, Cathy. You were quick today! I couldn’t resist your tantalising email — that ONE tip that fiction-writers use. And of course you did not disappoint! I have head “show, don’t tell” before but you have made it super-memorable. What I love about your blog posts is that you include so many examples. It ‘shows’ us things from a variety of angles and really drives home your point. From the novel excerpt to the cartoon (very clever, indeed!) to the outside examples and finally one from your own writing — it leave a very well-rounded picture. It reminds me to refer back to one of your other posts — I forget which — about using power words, especially adjectives. Thanks again, Henneke. I always enjoy your blog posts, and I learn something concrete from each one. I love using examples, but you knew that already. Love this! Brilliantly explained. Great book…and the cartoon nails it, btw… 🙂 …. wooww… show-tell, show-tell. haha Great post. This is as delicious as I expected it to be. Show and tell really works when you speak in the language of your target audience and address their pain points in your copy. And you are such an expert in “show and tell”. Hahaha. This is what makes you stand out because writing guides for copy can sound stiff and boring. But you make it fun with your illustrations and real life examples. Thanks again for giving so much value. Thank you so much for your lovely comment, Ruth. Great idea. Have to remember to add more sensory details from now on in my posts. Words are the SWORDS of truth that get readers’ attention when Sensory Words Offer Readers Details that Scintillate. Your cartoons really told the story of telling a story. I would love to have your drawing skills. They make your posts so…, well, so you. Why not try learning how to draw? A few years ago, I didn’t think I could draw even a simple stick figure. Then I took a course and started drawing every day. It’s much easier than you think! Great reminder! This is something that I feel is often absent from my business writing even though it is usually present when doing any other sort of writing, journaling, etc. For whatever reason, when it’s time to “write business-y”….or really do anything business-y, a lot of my emotion and vulnerability/authenticity goes out the window (and makes for a less engaging, interesting, and relate-able experience). Yes, I know what you’re saying. I don’t know exactly why this is, but a lot of business writing uses abstract terms and speaks in generics. It’s difficult for readers to connect with that. Often it helps to pay specific attention to this when editing. Leave your first draft for at least 24 hours, and then ask yourself how you can make the content more concrete and whether you can add a few examples or a case study. Small changes can make a big difference. I love your images, in the posts, because they “show.” So is that the real purpose of images? I’ve seen some images that act as breathing space for the content. How can one choose images so they are harmonious with the content? I do think that the best images aren’t mere decoration but add depth to the content – they explain ideas in a different way. I love your banner of I Love you. and I love your blog…. This was a really great post and a great reminder to implement both steps. This is something I’m more focused on doing nowadays. I think you’ve mastered this practice and everyone can use you as a constant example of how to do it correctly. I do my best to walk the talk. I’m always a little nervous that people will point out that I’ve taught to do A, but why am I doing B? Great! Now I have to go back and look at some of my content and make it better. Again! Seriously, thanks for not only telling us how to make our content better, but showing with some great examples. I love fantasy (Lord of The Rings for example) so I should have noticed that a long time ago. I have some work to do. Oops. I’m sorry to be giving you extra work, Ben! You just keep getting better and better at your craft! I found this whole post compelling, and I’m definitely going to adopt this idea more. It’s tempting to just tell people, but that takes out the intrigue. Without a touch of intrigue, it’s a trifle bland. Thank you for your compliment, Saleem. Our writing should be like a flow of river water. Thanks for showing us the 2nd dimension of the writing and telling us about its importance. You have shared some good examples of how to create better content. And I think I have to start working on this As soon as possible. A really useful post that will help my writing – thank you. Loved your examples. Fabulous article once again, lots of research, You are simply the best. Just been in the USA when the iPad Pro came out, could not resist it, the pencil was one of the reasons, then the weight the visual clarity. There we go, it is simply the greatest. I have quite an old iPad, but I don’t use it a lot. I’m still mainly a PC user. Have fun with your iPad, Annamarie! I just this minute finished a post. I have about 20 hours in it. Now I have to go back over it to see if I need to “breathe life” into it. Gee thanks, I think. You have a couple dogs at home right? Great drawings as usual. I’m sorry to give you extra work, Barry! And this may surprise you… I don’t have dogs at home. Perhaps having a dog is a secret wish I’m not even aware of? Hi Henneke, Thank you for outlining the distinction between telling and showing. Honestly, up until this blog I didn’t really understand the difference in terms of writing. I’m smiling because I’ve been doing a bit of both in my articles – I just didn’t know that’s what I was doing. Thanks for making me conscious of what I’ve been experimenting with! By the way, for a long time I’ve found the difference between showing and telling confusing, too. Exquisite post, Henneke! This whole time I was trying to balance showing and telling without even knowing it. I guess my main fear is not to get carried away. I’m thankful, in a way, to the corporate world (AND Twitter, for that matter) for teaching me brevity, so I can get my point across fast. And then I’m thankful to writers like you and many others I’ve been reading and *secretly* copying (shhh 😉 ) – more or less successfully – over the past years, for teaching me how to tell a story, by showing. Thank you for yet another amazing piece of content! Yes, Twitter is a good tool for learning brevity! I’m also nervous about getting carried away with too much “showing.” I usually delete a few details while editing (and then in other places, I add a couple of details). I guess that’s why writing is still partly art, because we have to develop a feel for giving enough details without losing momentum. Thank you for your lovely comment, Anca! I think we should come up with a better, fresher metaphor for show and tell! You don’t like the dog telling you he loves you? Hi Henneke. Am re-reading this post as it’s particularly relevant to a project I’m working on at the moment. However, I’m struggling to apply the principles to the web content I’m writing. It’s for a heavy, precision machining specialist (yes, I know!! ), and the tell and show approach feels too informal? But, I really want to strike out and set the content apart from their eye-wateringly boring competitors. Any advice on using this approach, appealing to emotions, but maintaining the professional feel? Thanks! Hi Ali, the principle is the same, no matter what industry you’re writing for. Telling would be our precision machining service is good, fast, or accurate. Showing explains exactly how your service is better, faster or more accurate—for instance, by sharing examples or case studies. And your customers have emotions, too: what irritates them in their work? What makes them stressed? And how does your service help them take away their frustrations? Again, share the finer details of how your company does this, so readers can imagine how you’d make their work easier. Great post, Henneke. Show don’t tell was drummed into me years ago when I first started writing short stories. It’s refreshing to see a different version used for sales copy as well. I wonder which other variations could be used in other writing avenues? Even in fiction, you don’t always need to show. Sometimes you can simply tell, because “telling” helps to go quicker through the story.